Not the high they were looking for! Two people from an Orange County neighborhood are lucky to be alive, after a terrifying accident left them dangling from a second story building. The driver admitted to driving while under the influence of drugs to responding EMT’s at the scene of the crash. According to Santa Ana Police Department, the collision occurred shortly before 5:30am near the intersection of 17th and French Streets. The driver of the White Nissan Altima crossed three lanes on 17th avenue before hitting a center divider, which then launched the car into the two-story building. The impact caused a small fire to begin but was quickly extinguished after firefighters arrival. The vehicle’s passenger was injured in the crash, but somehow able to escape the sedan without assistance. Firefighters responded to the scene and extinguished the blaze, then extricated a second person that was trapped inside the sedan. Police say the center median had a dirt mound, which likely contributed to the car launching into the air. They say no other vehicles were involved in the incident. In a shocking surveillance video, the crash is caught on tape with an unobstructed view. You can clearly see the speeding Altima narrowly miss colliding with another car and then hit the center divider. After hitting the center divider, the car becomes air born and then barely misses hitting a city bus. 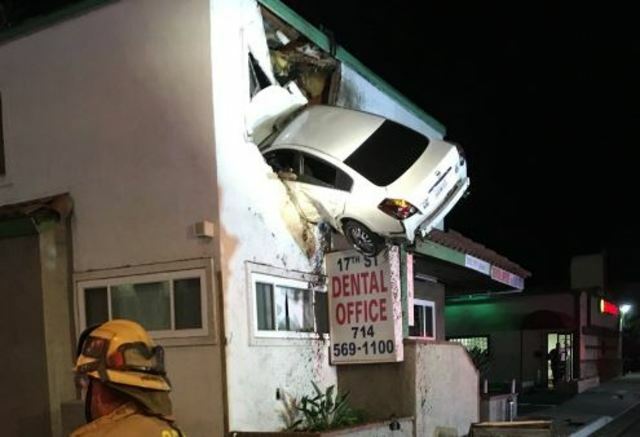 The car then ends up stuck in the 17th St Dental Office building, hanging mid flight. A fire department wrecker truck was called into the scene and removed the car from the side of the building. The driver of the Altima, whose name is being withheld, was later arrested for suspicion of driving under the influence, Santa Ana Police reported on Sunday Afternoon.